Dakota is the sweetest GSD around. Everyone who met Dakota instantly fell in love with him....He has a disposition and personality that could not be matched! Dakota loves people and fellow K-9s.....He even liked the many doctors who poked him constantly...Never once would he growl, bite, or whimper....If anything, he would kiss them. Dakota spent the first 3 yrs of his life (8 weeks-3 yrs) making people happy at Regina Nursing home where my mom and aunt spent some time...If ever I showed without him, I would totally be IGNORED! Not even so much as a "hello, how are you?" I certainly knew where I stood! Dakota (Kody as he was called), loves the water - hence the beachcomber picture.....He wants to retrieve in the bay 24-7 or as long as my arm would allow..
Dakota was runner-up in a contest given by Via Vanti Restaurant and Guiding Eyes for the Blind called "Dogs In Party Hats". We had to submit a picture with a hat and give a name for a gelato or subetto with a description that matched. Story: I'm a delicious golden brown with a splash of chocolate caramel. Made with real german chocolate and pinch of tequila. 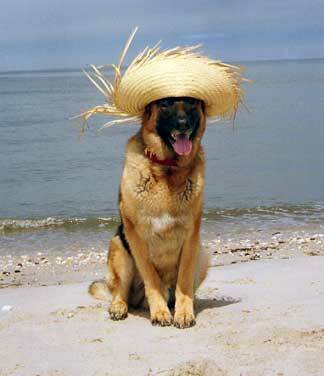 A real dog days of summer cool down for a lazy beachcomber. I hope you enjoy Dakota!